The Hillsboro swim team third at a meet at Solomon on Saturday. ?It was a good meet for us if you consider we had about half our swimmers there,? coach John Vineski said. Solomon scored 580 and took the top spot, Council Grove followed with 385 and Hillsboro finished with 307. Shelley Dunham and Jenny Gihring combined for a one-over-par 36 to win the Hillsboro Ladies Golf Invitational Tournament June 21. Aaron Stepanek dives back into first base ahead of a pickoff attempt and inadvertantly touches off a dust storm in the first inning of a 6-4 victory over Abilene. Stepanek was safe, then went on to steal second base and came around to score on a triple by Travis Riesen. Click image to enlarge. 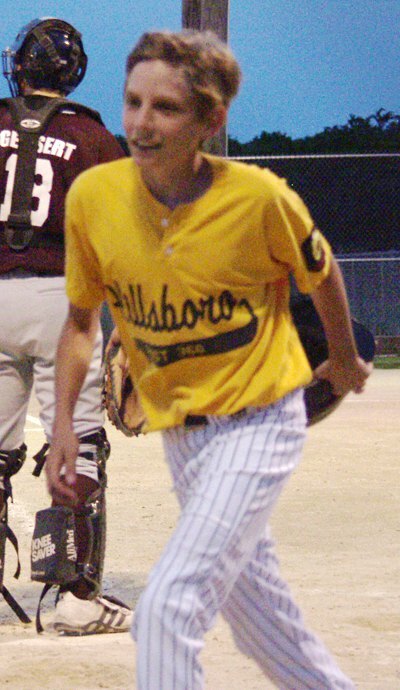 Hillsboro Legion Post 366 won three of four games last week to raise its season record to 10-2. 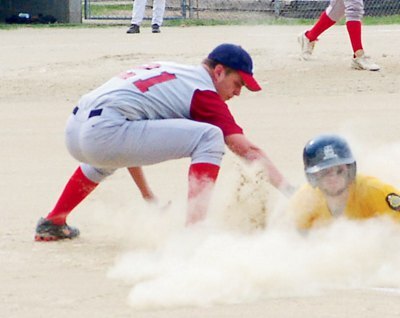 On Tuesday, Post 366 lost the first game of a doubleheader with Moundridge, 5-3, but rallied in Game 2 for a 5-1 win. Two days later, Post 366 won both games at Abilene, 6-4 and 6-3. Travis Riesen snaps off a curve ball and strikes out a Lyons batter looking to end the fourth inning on Thursday. He struck out nine and Legion Post 366 claimed a 7-1 win. Andrew Ottoson / Free Press. Click image to enlarge. Hillsboro American Legion Post 366 added four more wins to its resume this week and improved its record to 7-1. Hillsboro outscored Peabody 11-4 and 16-11 on Tuesday. On Thursday, Hillsboro tallied a 7-1 win over Lyons before eking out a 12-11 victory in the second game. Lyons?Travis Riesen took the hill for the first game and allowed one run and six runners in seven innings. Gavin Serene heads to the dugout after scoring what turned out to be the game-winning run in the top of the third inning of an 11-2 drubbing of Herington. Photo by Andrew Ottoson. Click image to enlarge. Legion Post 366 opened its season on Tuesday at Memorial Field and earned a split with Abilene. 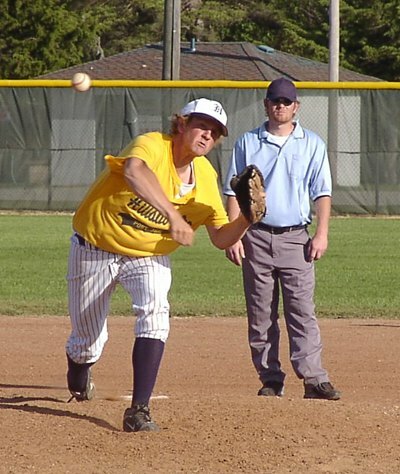 On Thursday, the team traveled to Herington and hammered out wins of 17-2 and 11-2. Herington?In the top of the first inning, Hillsboro jumped out to a 4-0 and never looked back. Coach Tim Hein described the early-season offensive eruption as a product of ?great at-bats and timely hitting.? ?We?ve worked ourselves into good counts and that makes a big difference,? he said. At the Family Folk Festival fun run on Saturday, local marathoner Todd Lehman won the 5-kilometer race in 18 minutes, 57 seconds.